Take photos with the dolphins and have memories that will last a lifetime! 100% must see show. trainer and their seal and dolphin was amazing. my daughter enjoyed the show very much. 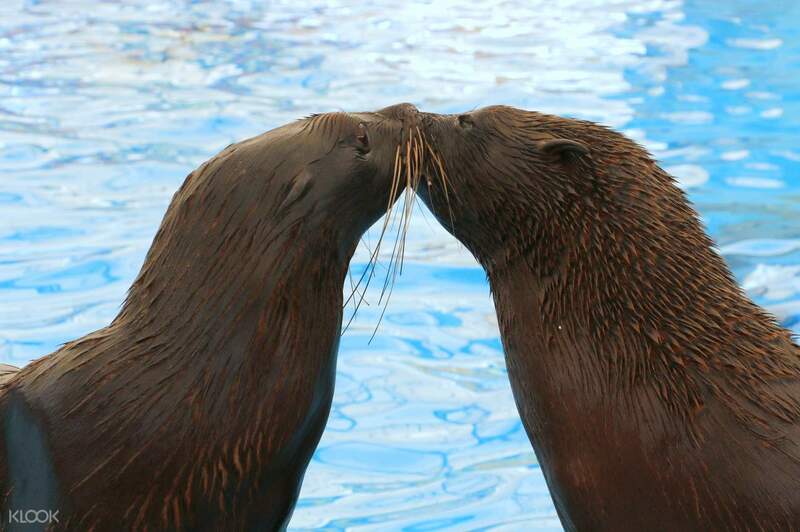 if you choose vvip and vip seat then tight your sitting for a splash and kiss from the seal. 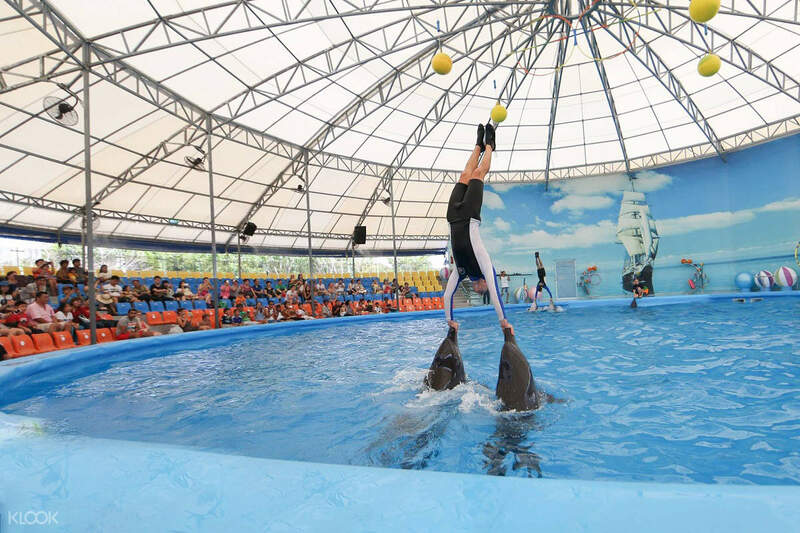 If you've ever wanted to see dolphins doing tricks and performing for a crowd, then this is the perfect show for you! 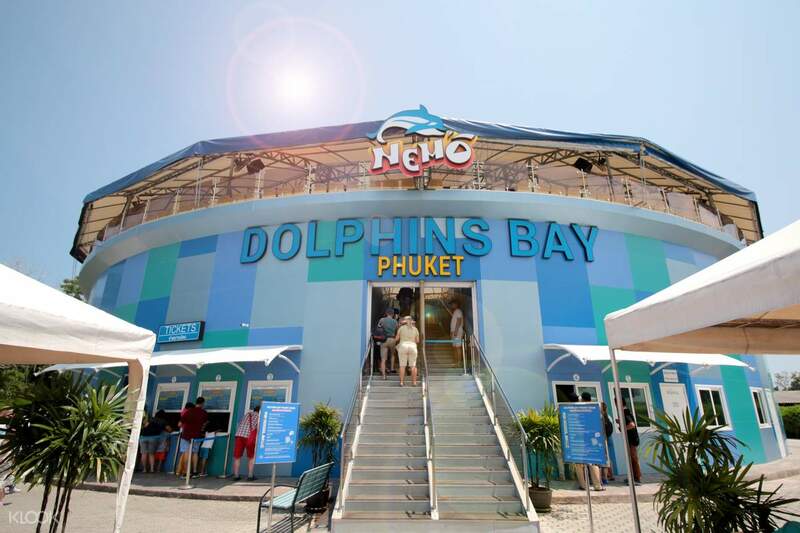 Catch a 45 minute dolphin show showcasing the tricks of these talented and intelligent animals at Nemo Dolphins Bay Phuket - a perfect activity for family and friends. Delight in the quirky tricks and games the majestic creatures and their trainers have prepared for you. You can even choose to add to your experience by taking photos with them! There are three show timings at 11:00am, 2:00pm and 5:00pm, great to suit your busy schedule. Plus, have the option to get transfers to go along with your ticket for a hassle free visit! 100% must see show. trainer and their seal and dolphin was amazing. my daughter enjoyed the show very much. if you choose vvip and vip seat then tight your sitting for a splash and kiss from the seal. 100% must see show. trainer and their seal and dolphin was amazing. my daughter enjoyed the show very much. if you choose vvip and vip seat then tight your sitting for a splash and kiss from the seal. Brilliant, I think I got more excited than my daughter, we when for front row seats, pay more but best decisions, you get to interactive with the seals and get wet would recommend this to all, Would go again next time in phuket. Brilliant, I think I got more excited than my daughter, we when for front row seats, pay more but best decisions, you get to interactive with the seals and get wet would recommend this to all, Would go again next time in phuket. Show was magnificent and my kids loves it. Luckily we booked the normal unless you wanna get wet from the splash. Driver fetch us on time and reach the place early for us to redeemed our ticket and take photos with the dolphins without any hassle. Show was magnificent and my kids loves it. Luckily we booked the normal unless you wanna get wet from the splash. Driver fetch us on time and reach the place early for us to redeemed our ticket and take photos with the dolphins without any hassle. I won't ever ever regret buying this show! I will definitely buy again if I come here again. Transportation so perfect, the will pickup you up on time. Really worth to take include transportation since the place really far from Patong. My suggestion, don't take this package with 'photo package' bexause you can purchase it at the show place and it cheap. Only 400baht per session(limit 4 people in the photo). And the show, full of entertainment, you won't get rid of your smile. You face will smiling entire time. They're so cute! I won't ever ever regret buying this show! I will definitely buy again if I come here again. Transportation so perfect, the will pickup you up on time. Really worth to take include transportation since the place really far from Patong. My suggestion, don't take this package with 'photo package' bexause you can purchase it at the show place and it cheap. Only 400baht per session(limit 4 people in the photo). And the show, full of entertainment, you won't get rid of your smile. You face will smiling entire time. They're so cute! Our bestest and closest encounter with dolphins. We chose to sit in the front row because of the good reviews we saw. My 2yo son was so scared yet excited when the 2 seals kissed him! The venue operator handed out ponchos prior to the dolphin show, there was a guy who chose not to wear it, resulting him being soaking wet cos the dolphins splashed water onto him! The dolphins were really smart, talented and amazing. Pics taken are from the front row, no heads blocking! Our bestest and closest encounter with dolphins. We chose to sit in the front row because of the good reviews we saw. My 2yo son was so scared yet excited when the 2 seals kissed him! The venue operator handed out ponchos prior to the dolphin show, there was a guy who chose not to wear it, resulting him being soaking wet cos the dolphins splashed water onto him! The dolphins were really smart, talented and amazing. Pics taken are from the front row, no heads blocking! it was really fun watching this show. 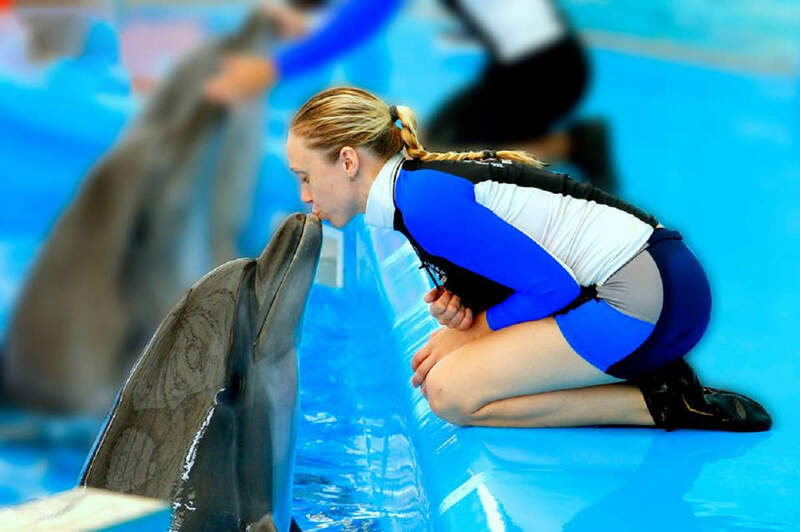 Dolpin and seal were amazing and they were trained exceptionally well. I didnt felt any bad attitude towards dolpins or seal by instructor as they were bonding really well. only negative thing was the hot weather , the hall has no Air con and only have fan which doesnt helps. overall it was fun experience and must for kids. it was really fun watching this show. 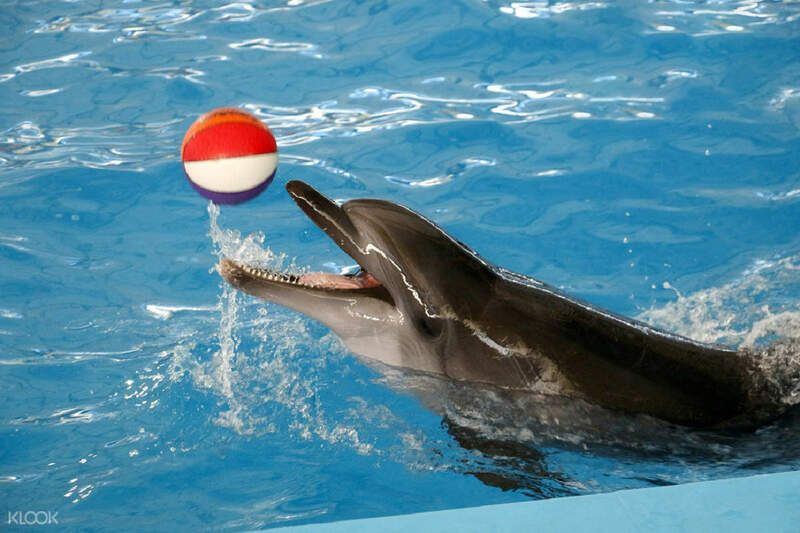 Dolpin and seal were amazing and they were trained exceptionally well. I didnt felt any bad attitude towards dolpins or seal by instructor as they were bonding really well. only negative thing was the hot weather , the hall has no Air con and only have fan which doesnt helps. overall it was fun experience and must for kids. What can i say..fantabulous would be the right word to use...even they themselves know that they are best in asia.Take vip seats for amazing views...u wl get wet but worry not as they give free ponchos...n yes dont miss photo with dolphin. What can i say..fantabulous would be the right word to use...even they themselves know that they are best in asia.Take vip seats for amazing views...u wl get wet but worry not as they give free ponchos...n yes dont miss photo with dolphin. Loved loved the show, totally worth it the trip and ticket money. There's an opportunity to swim with the dolphins but it's too pricey, understandably so. Taking a photo with the dolphin is a must. If you have children they'll be very excited for this, as you get to see the dolphins up close from where you're sitting. Loved loved the show, totally worth it the trip and ticket money. There's an opportunity to swim with the dolphins but it's too pricey, understandably so. Taking a photo with the dolphin is a must. If you have children they'll be very excited for this, as you get to see the dolphins up close from where you're sitting. the show was amazing, I couldn't believe that the dolphins could perform as human. highly recommended show, u should buy the dolphins painting, it should be the best 🎨 one. enjoy the show guys. the show was amazing, I couldn't believe that the dolphins could perform as human. highly recommended show, u should buy the dolphins painting, it should be the best 🎨 one. enjoy the show guys.